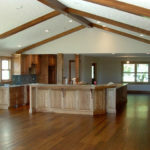 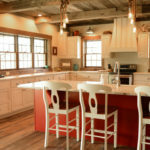 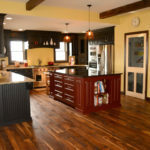 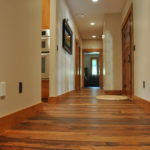 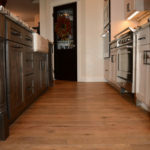 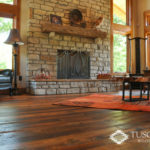 Reclaimed wood flooring is one of the most unique and environmentally friendly items to accent your home or business. 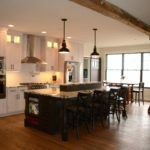 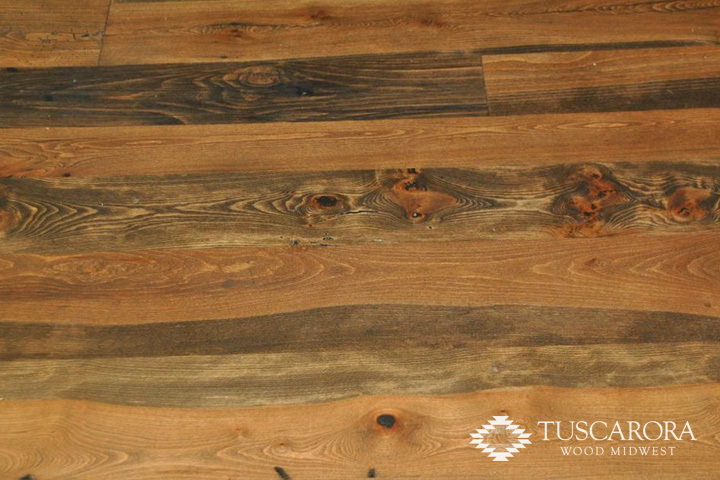 Whether you have a cabin in the mountains, a contemporary house in the city or an urban office building, reclaimed hardwood will add warmth and charm like only years of natural wear and character can produce. 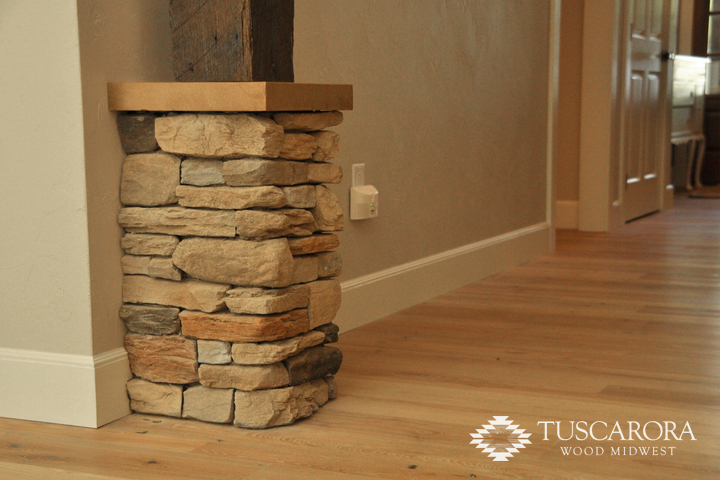 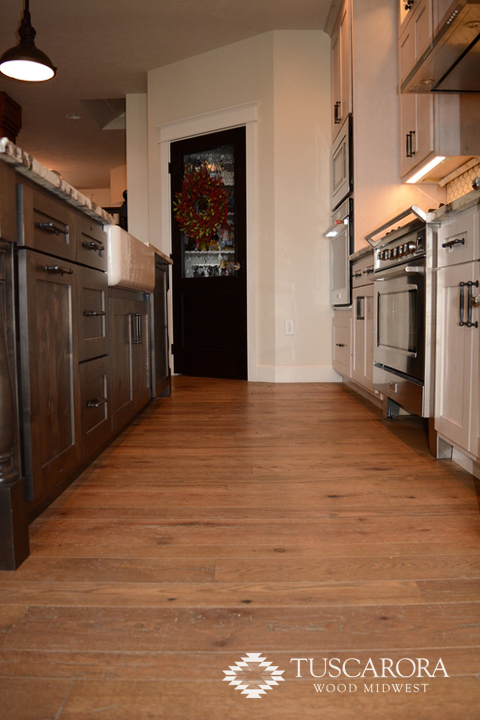 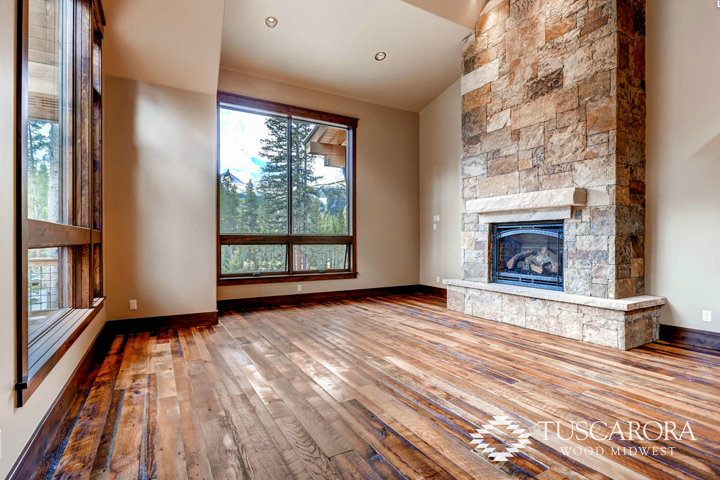 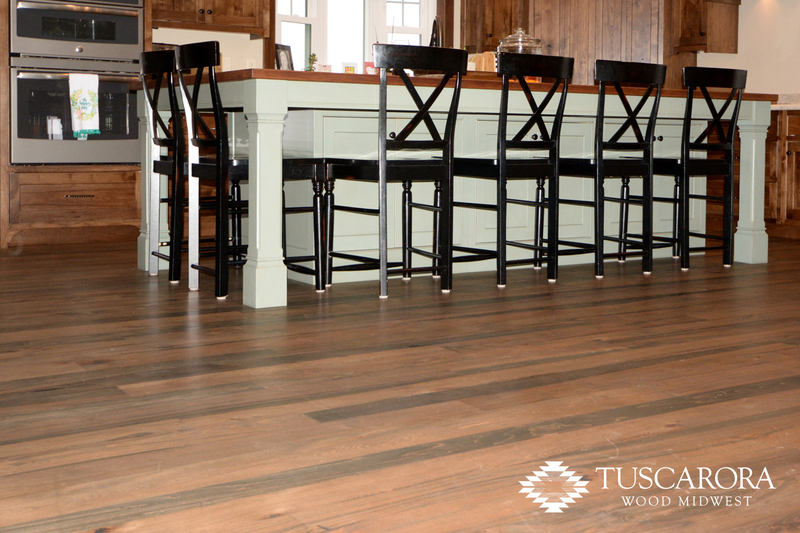 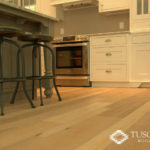 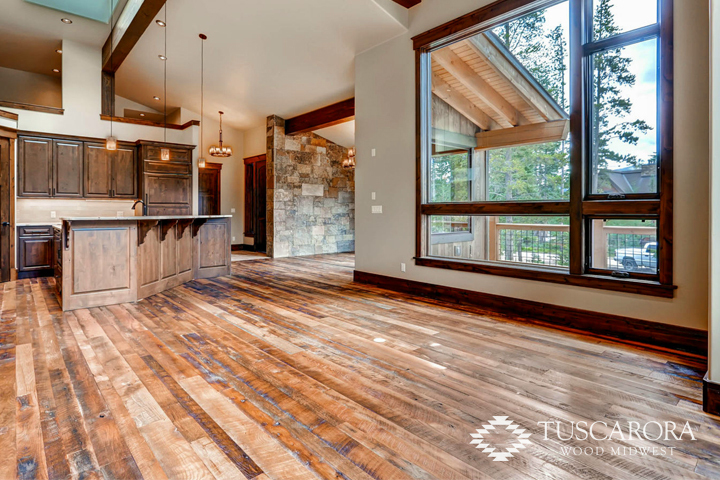 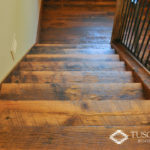 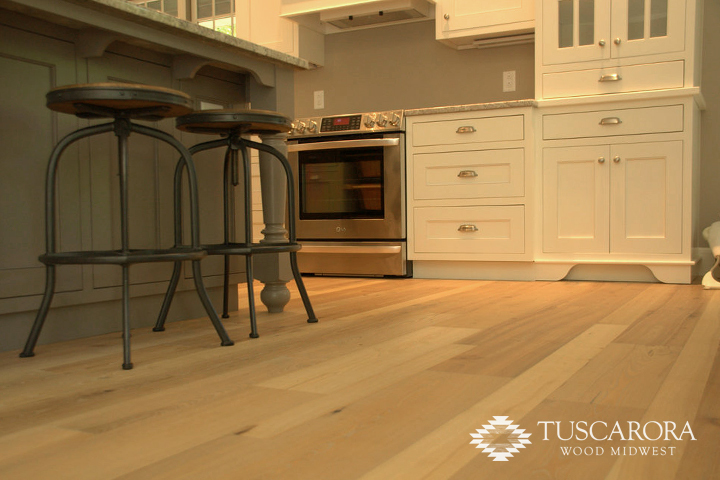 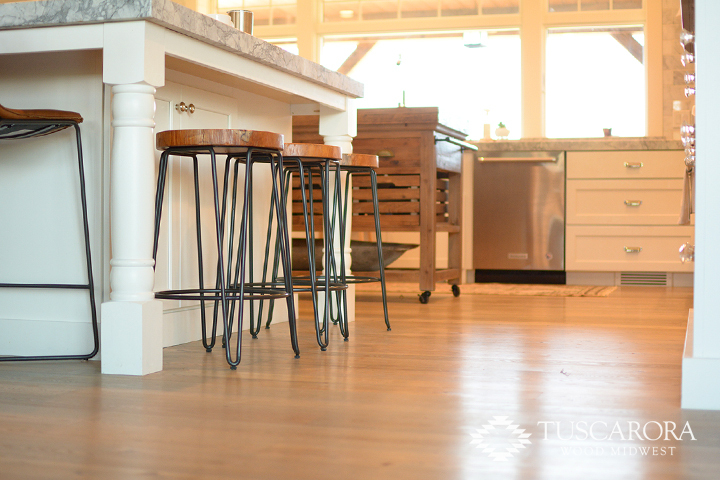 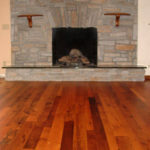 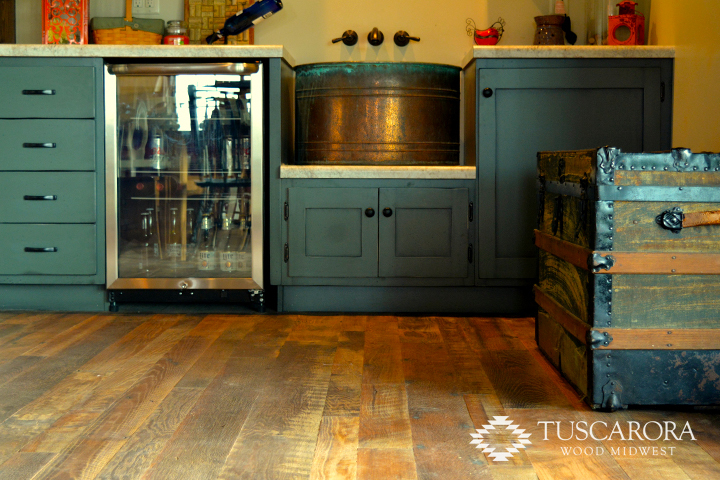 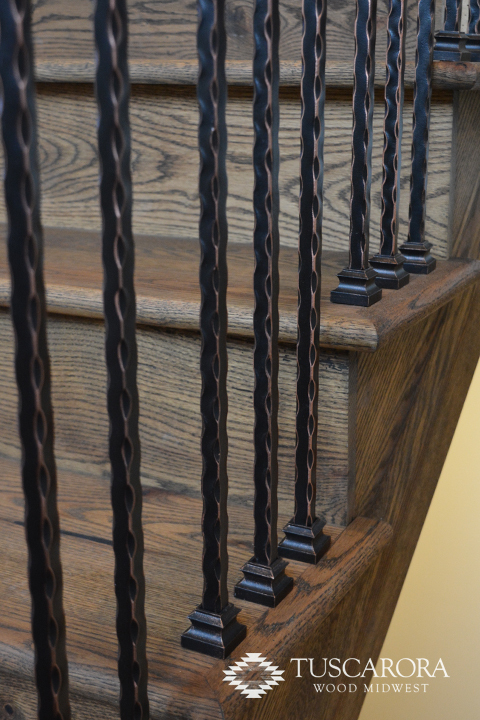 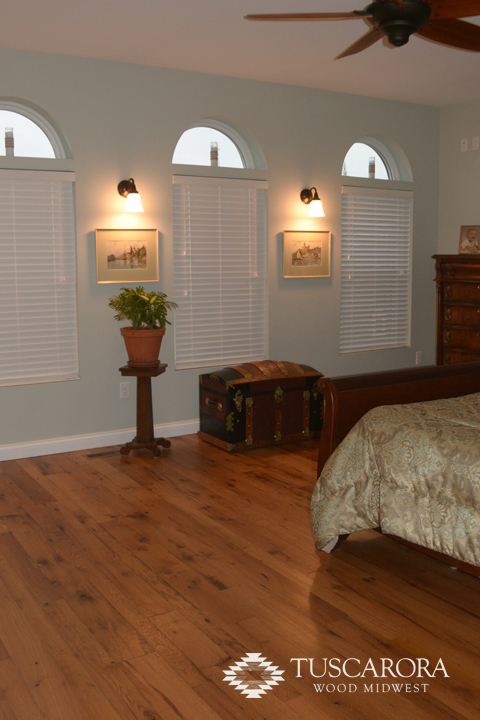 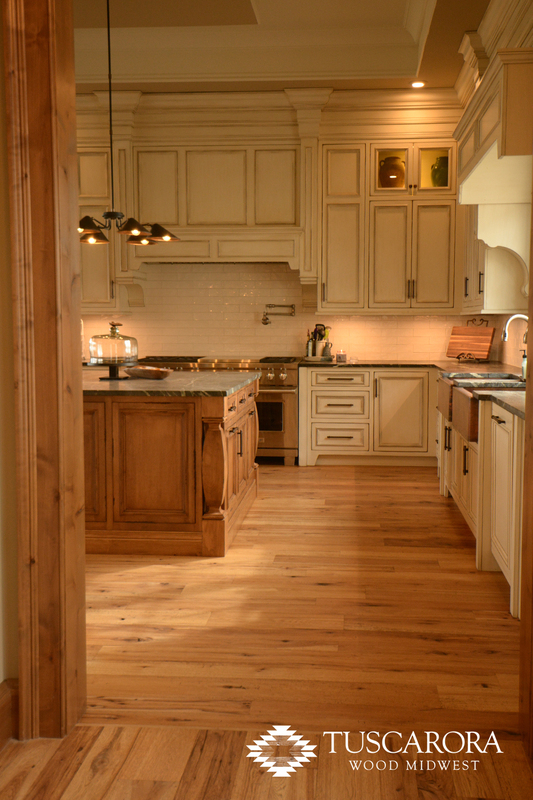 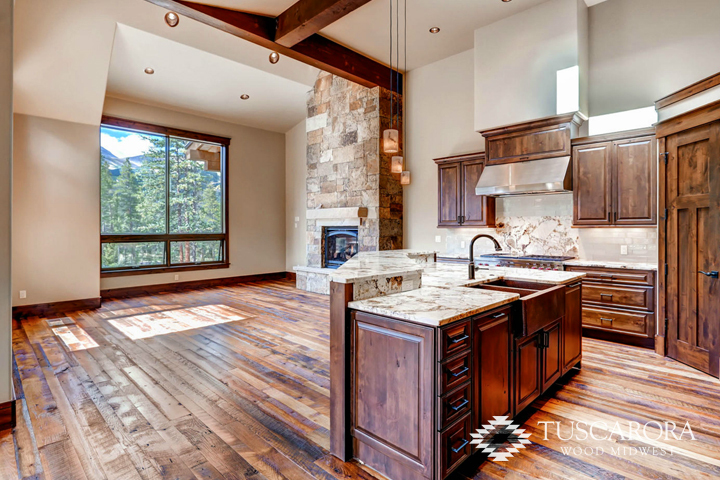 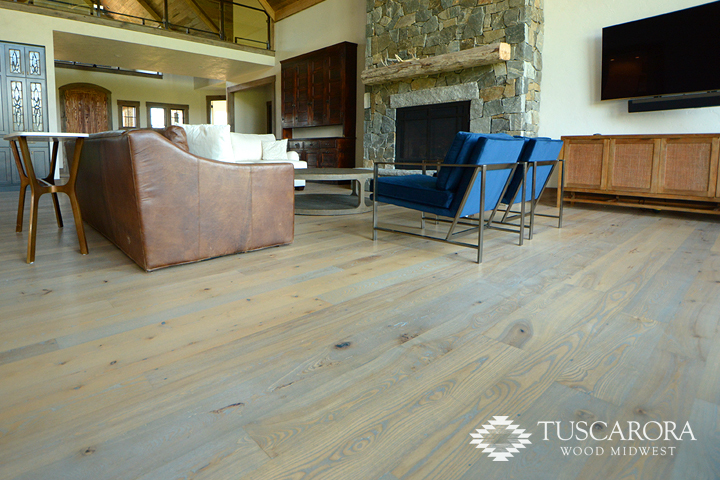 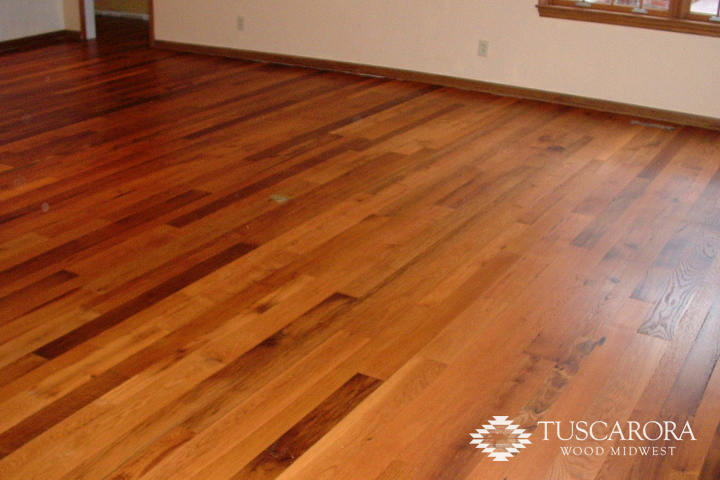 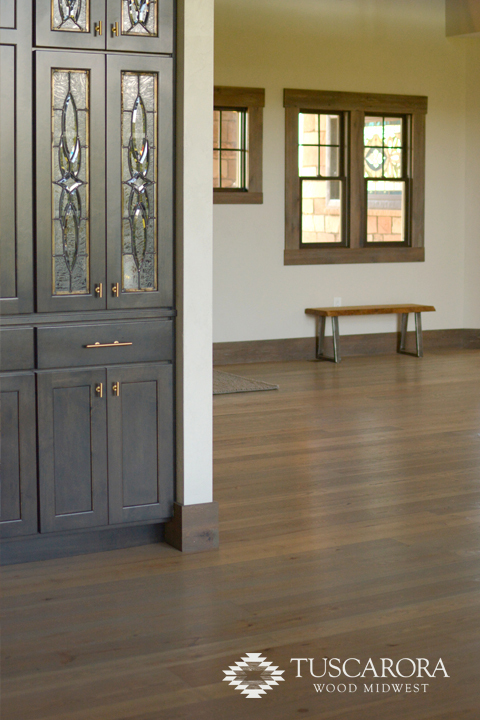 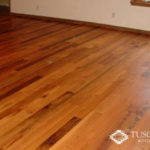 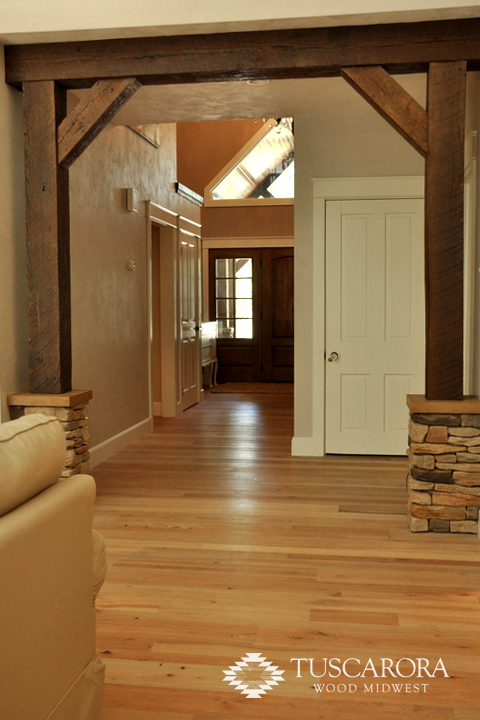 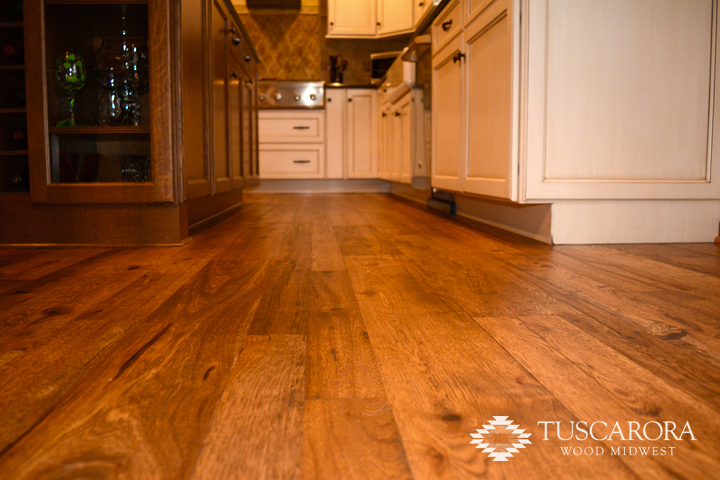 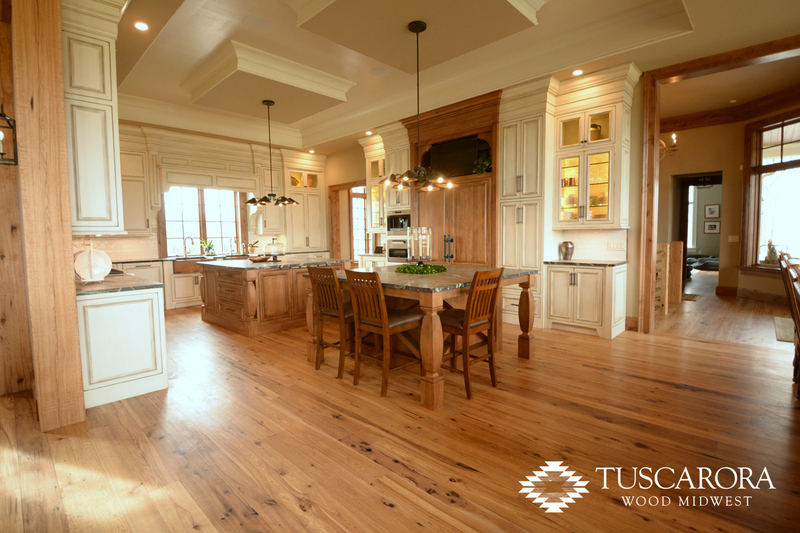 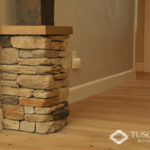 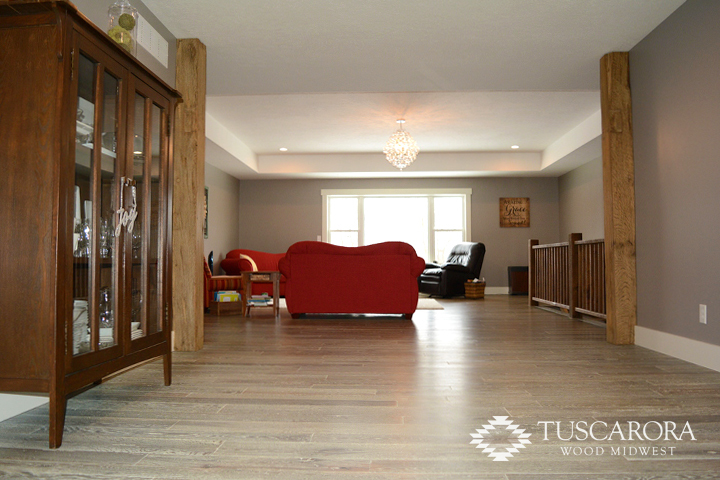 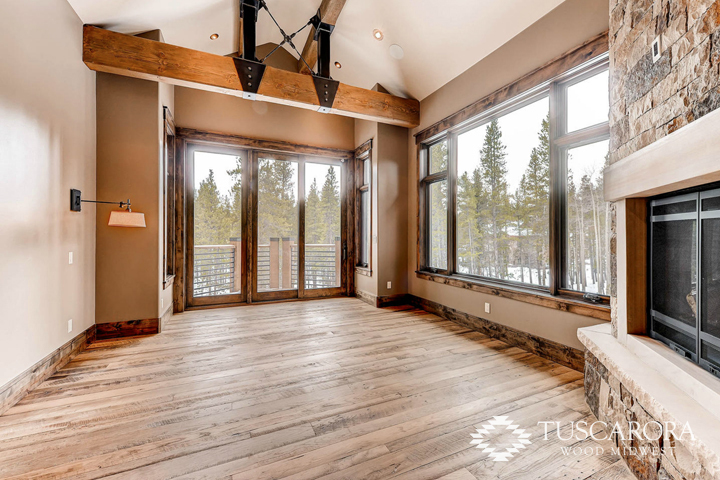 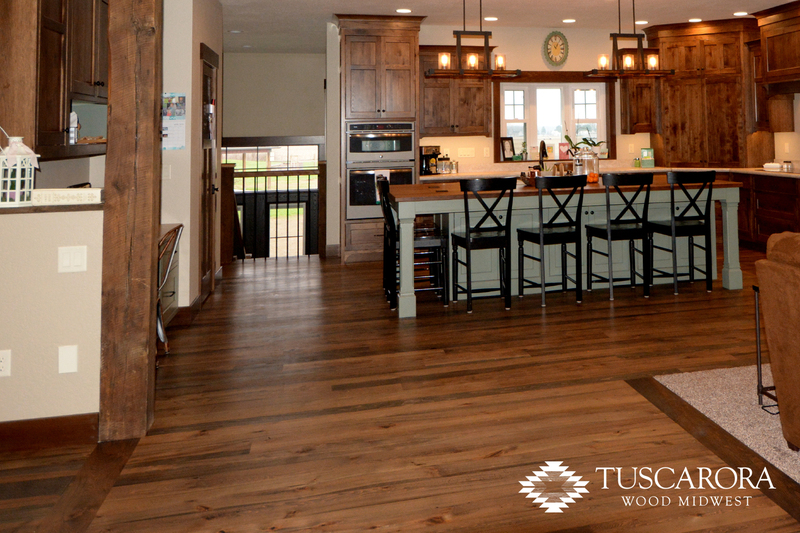 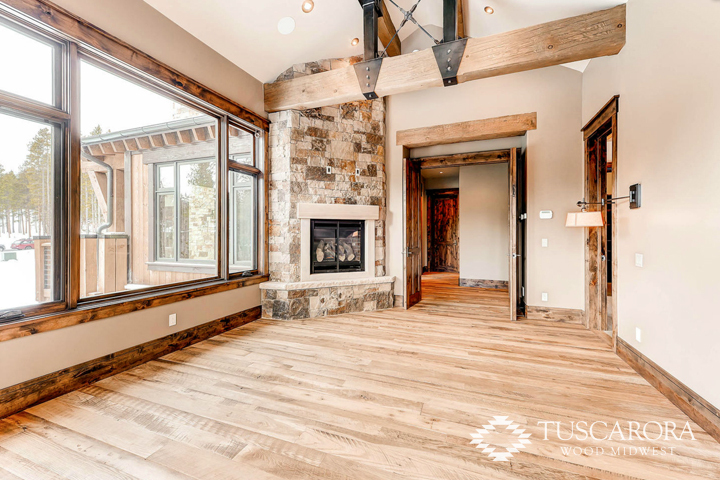 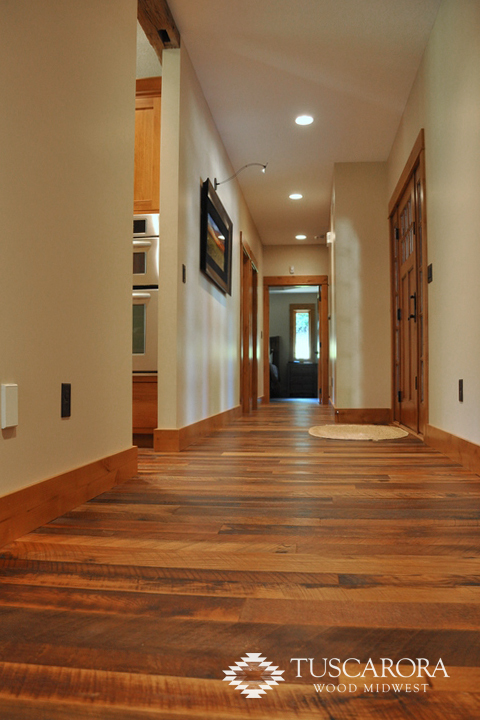 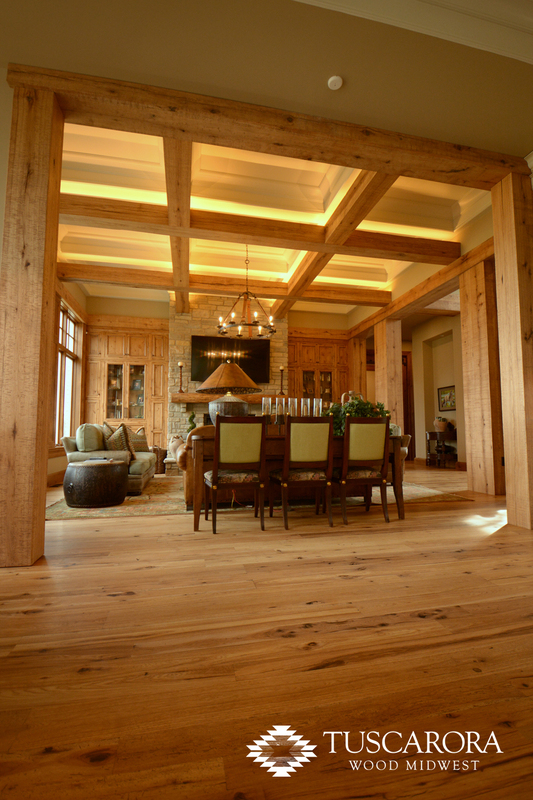 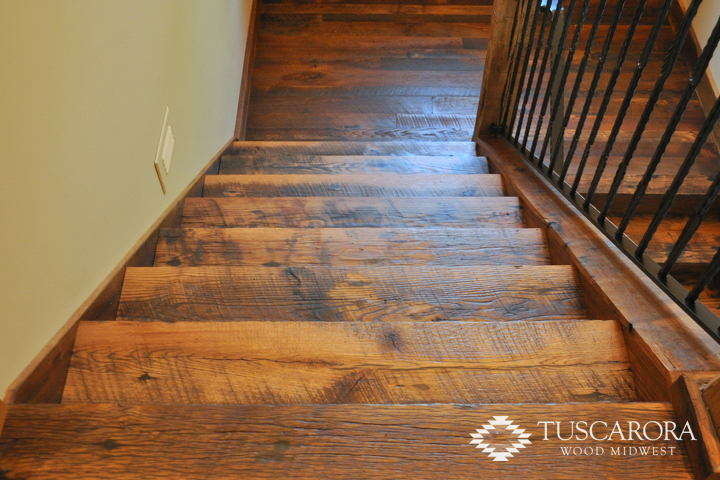 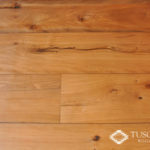 Each Tuscarora floor is hand selected and custom milled to your specific requests. 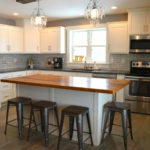 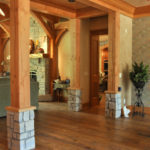 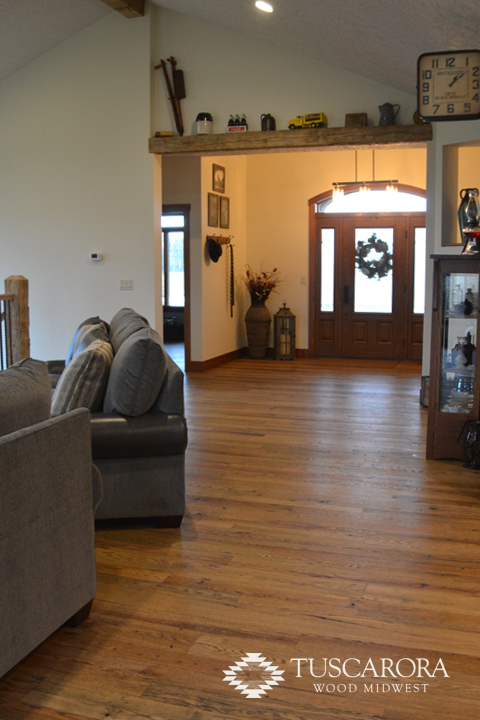 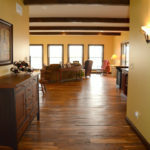 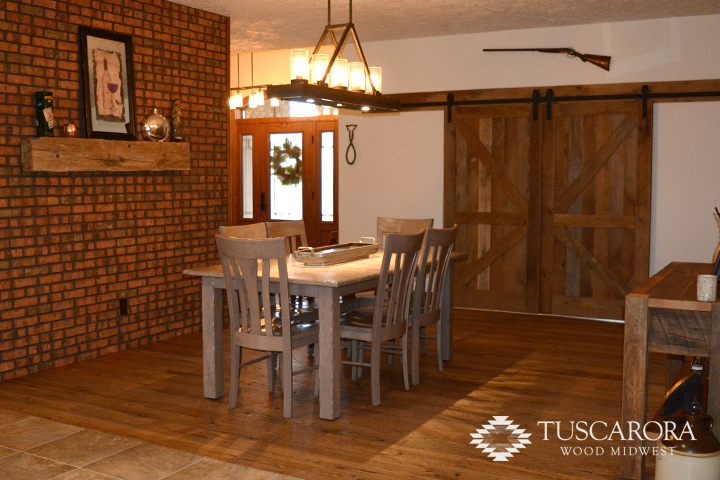 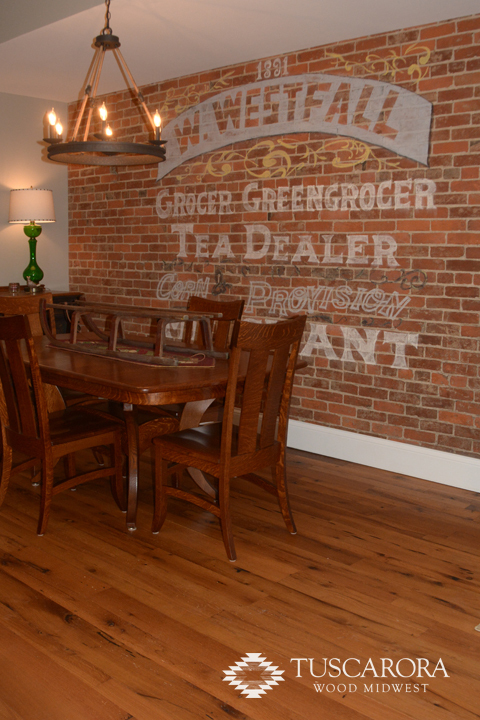 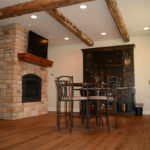 In the Ohio, Indiana and Kentucky tri-state area we offer full installation preserving the reclaimed wood with our long-lasting hardwax oil finish. 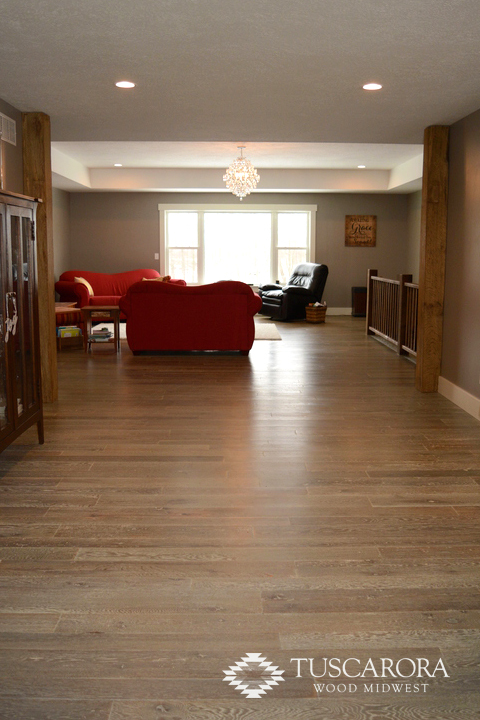 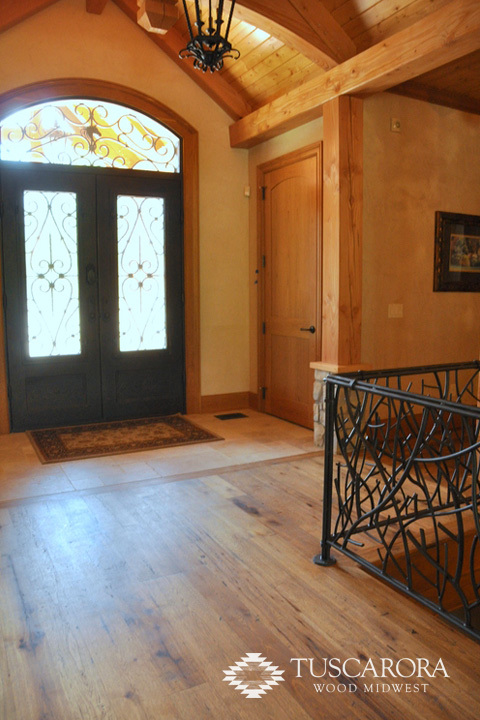 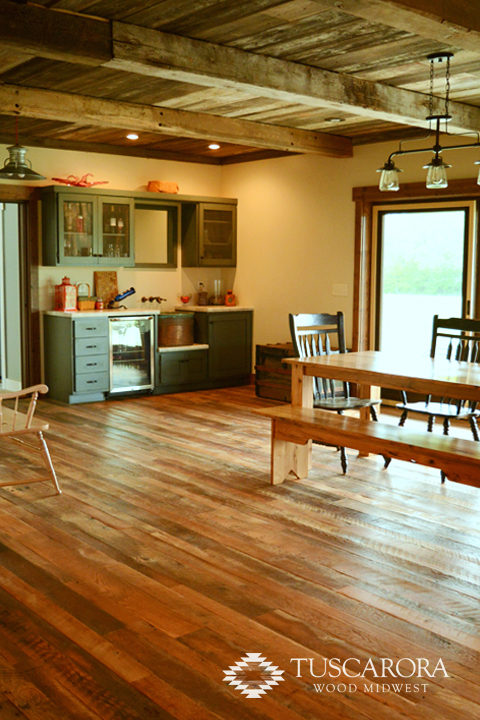 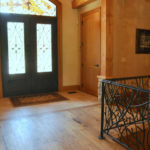 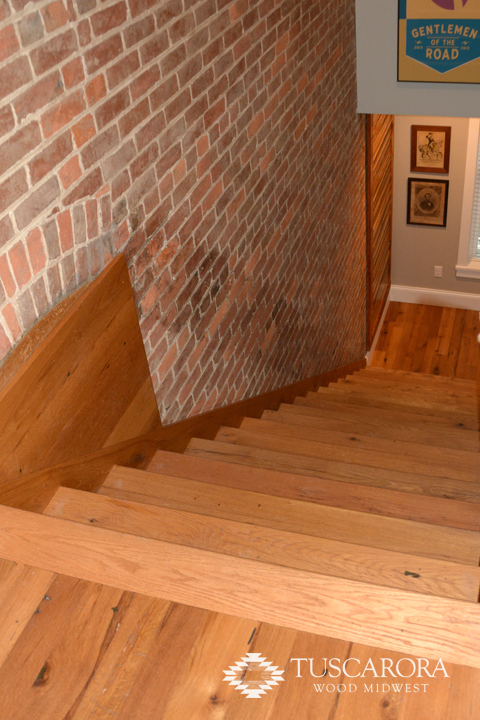 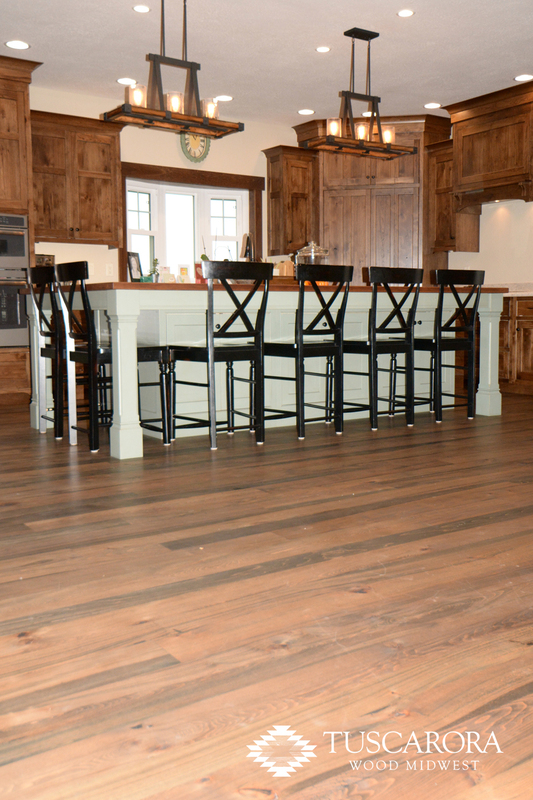 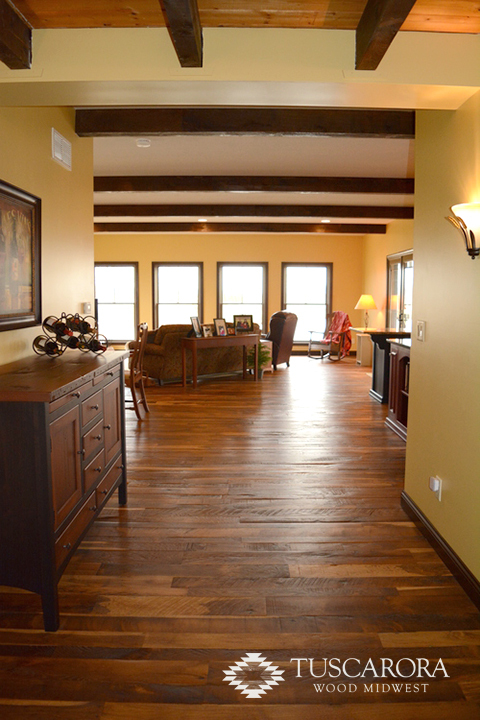 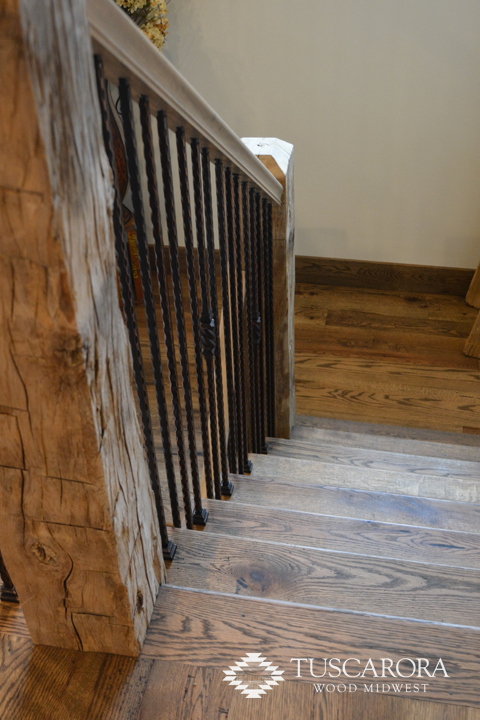 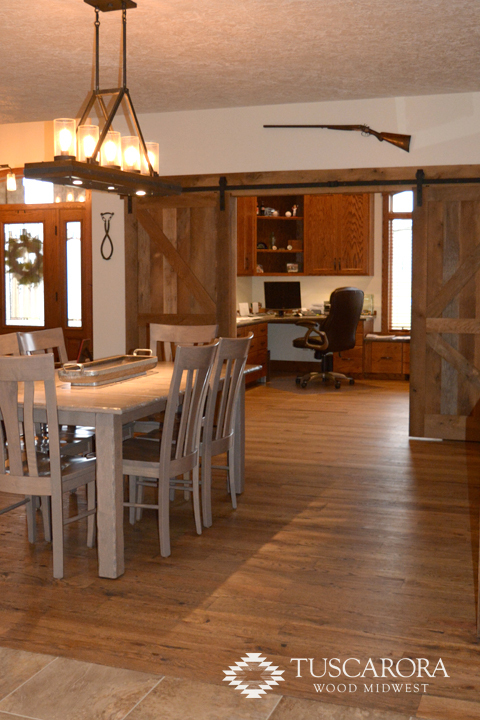 Our aged sawn flooring techniques offer a beautifully rustic style for any application. 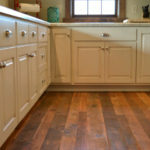 While the high spots are milled smooth, the original saw marking and patina are left on the surface creating a uniquely textured and aged floor. 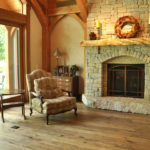 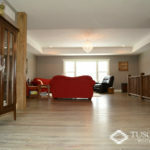 Our aged sawn flooring is available in two distinct wood types, a very high-quality red oak hardwood flooring or a mixed hardwood flooring, both of which add value and beauty to any home. 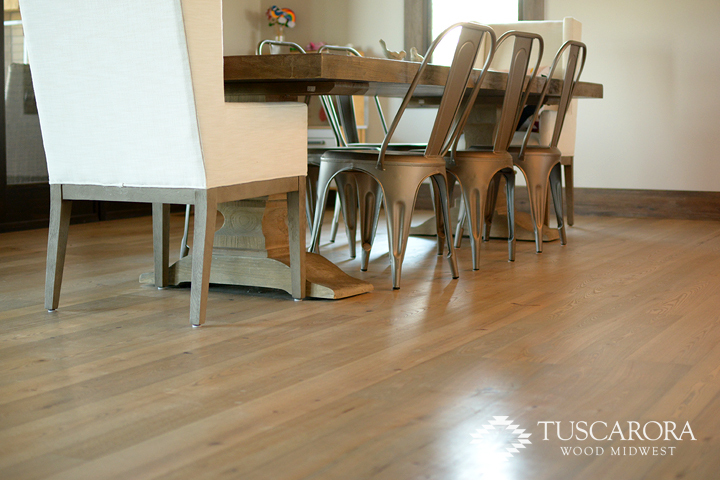 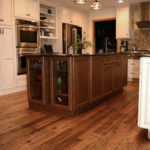 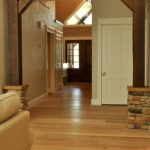 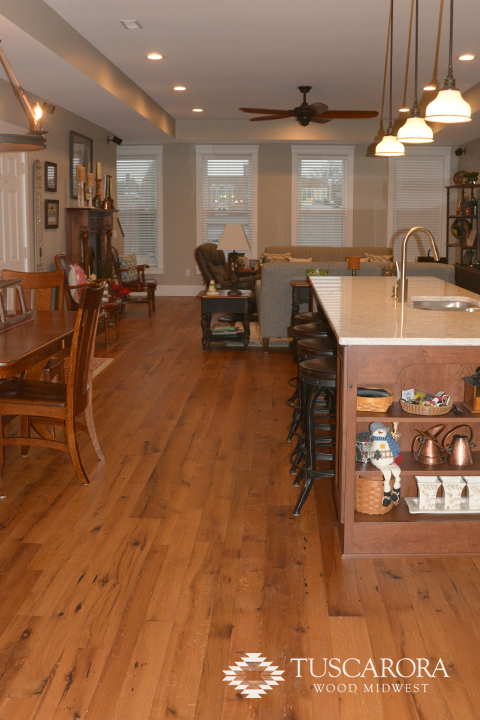 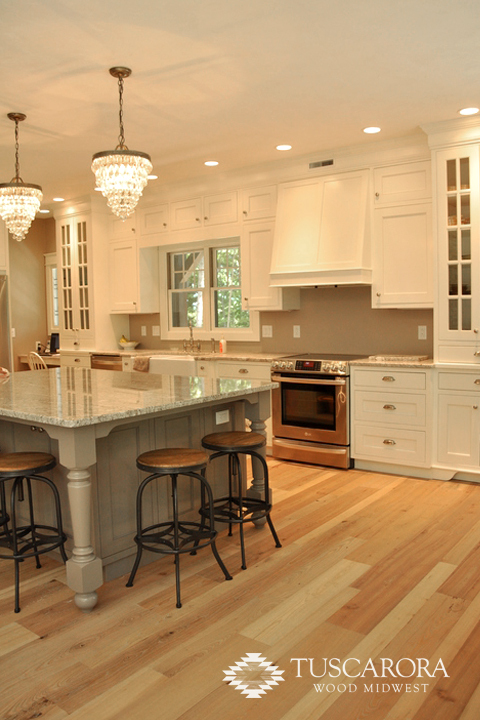 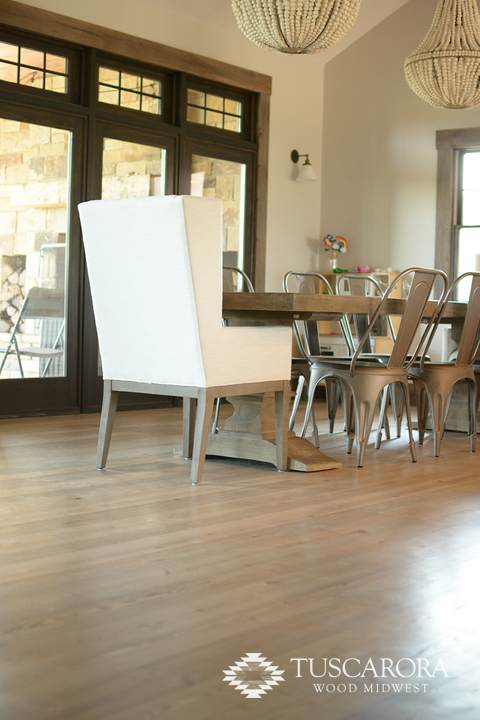 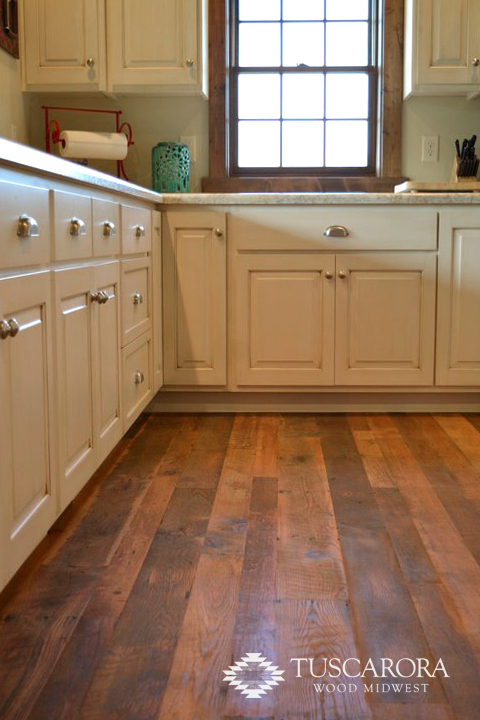 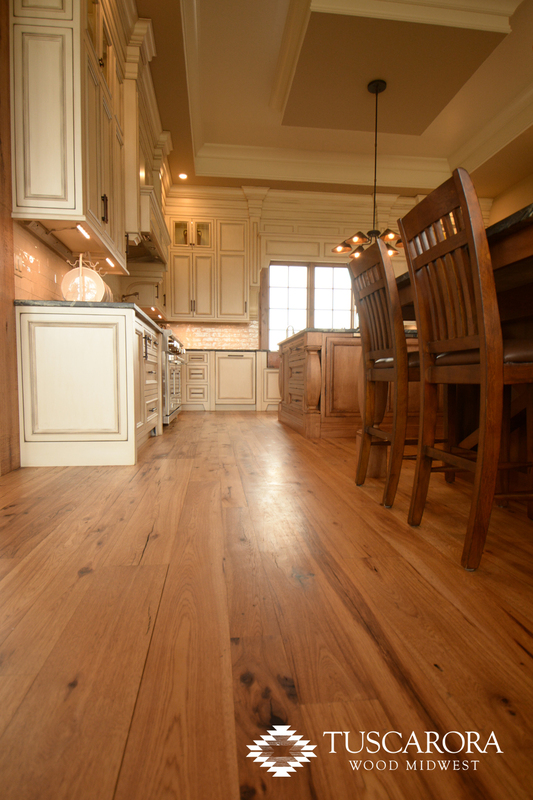 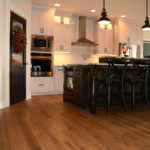 With its tight grain and rustic character, white oak is one of the hardest, most durable floors available. 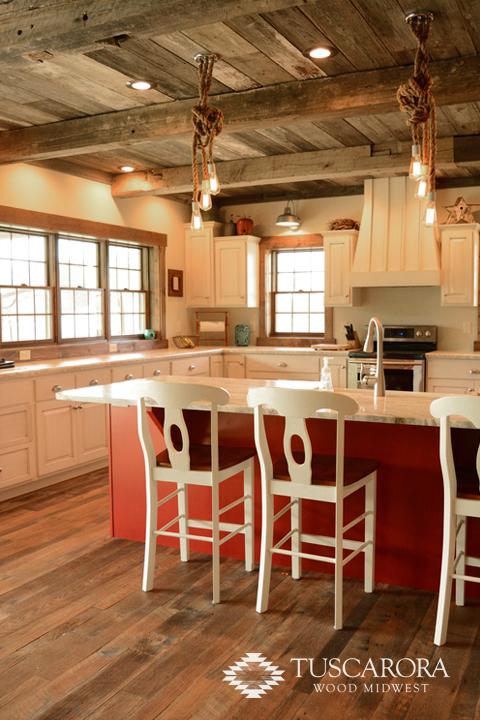 Color ranges from light honey to a rich brown. 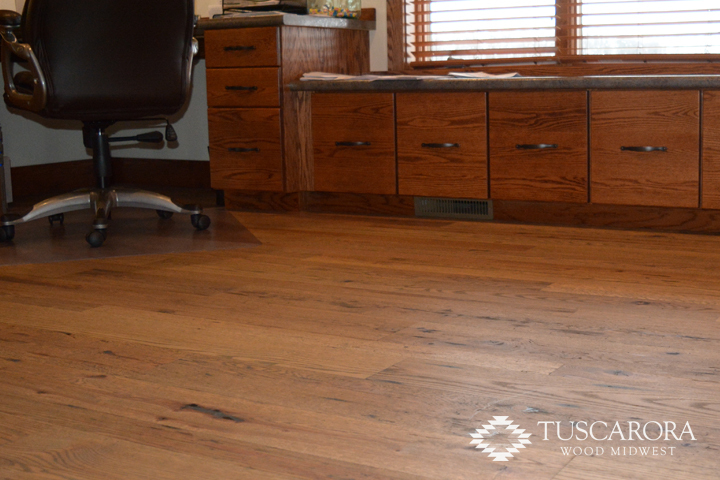 Red Oak consists of an open grain structure with red to pink hues. 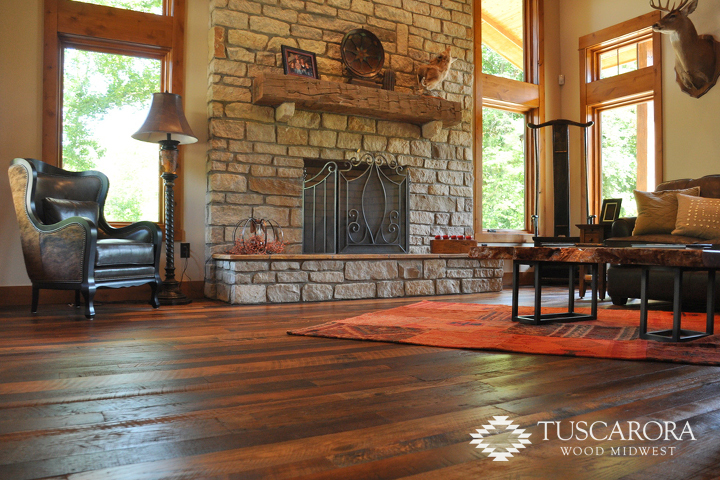 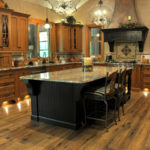 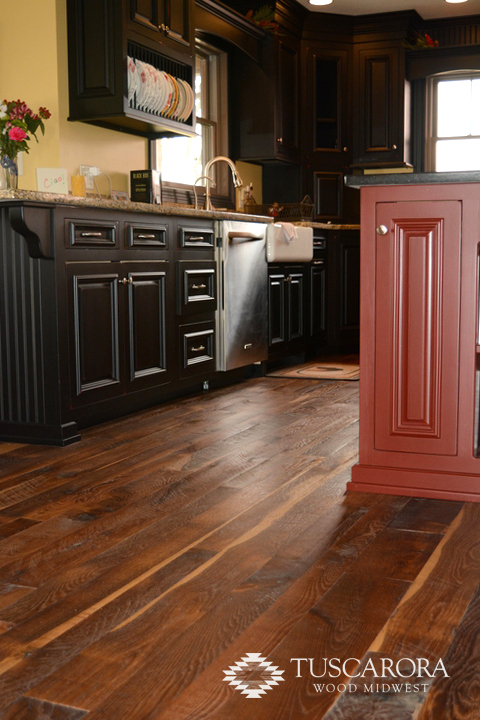 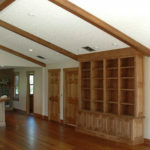 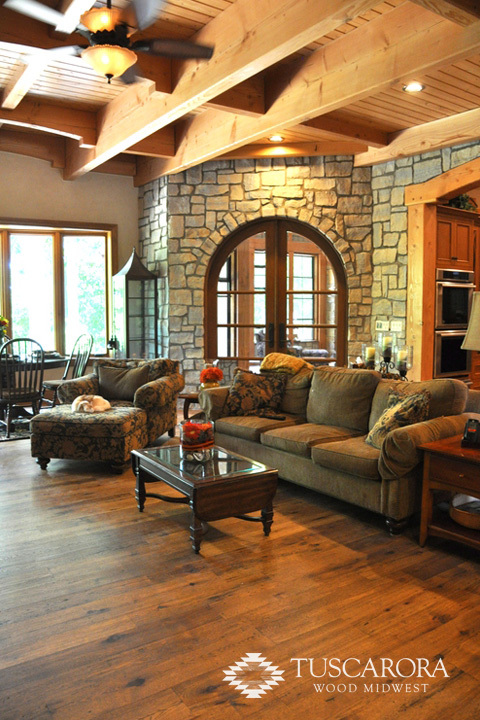 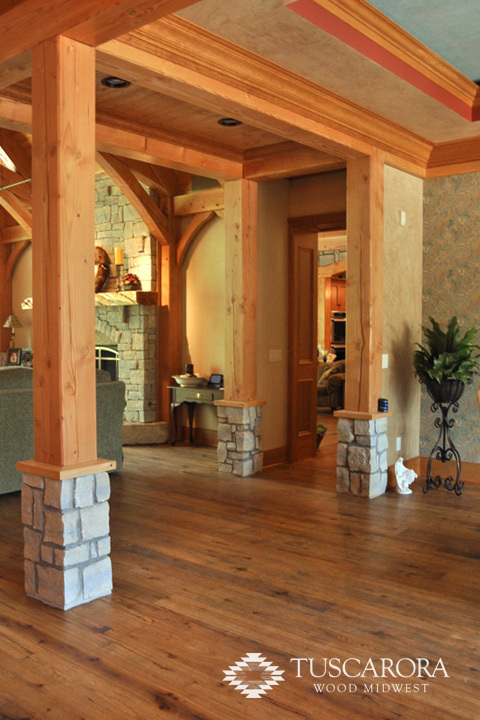 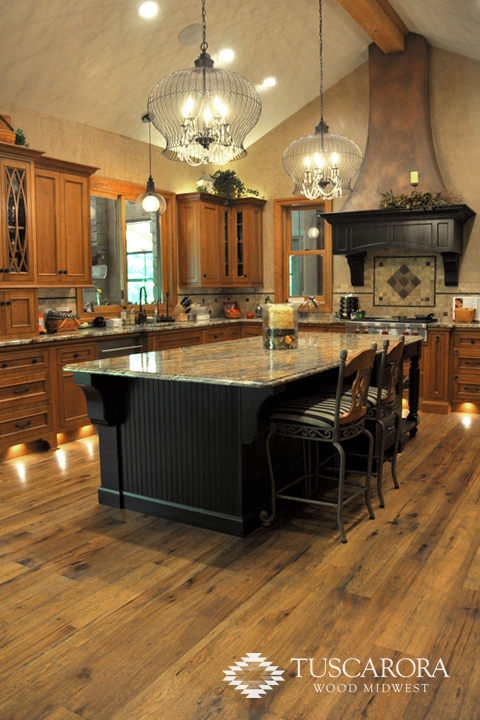 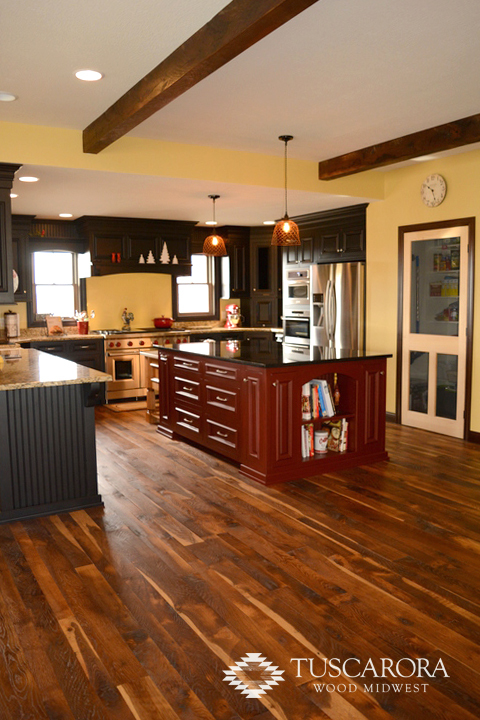 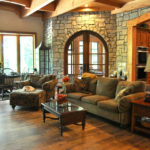 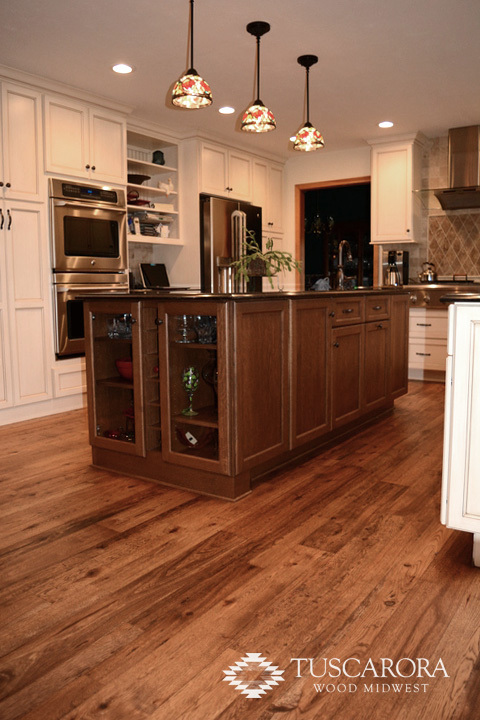 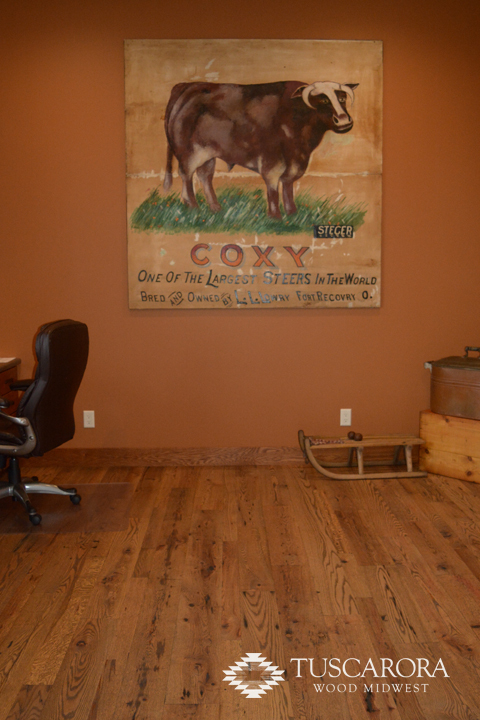 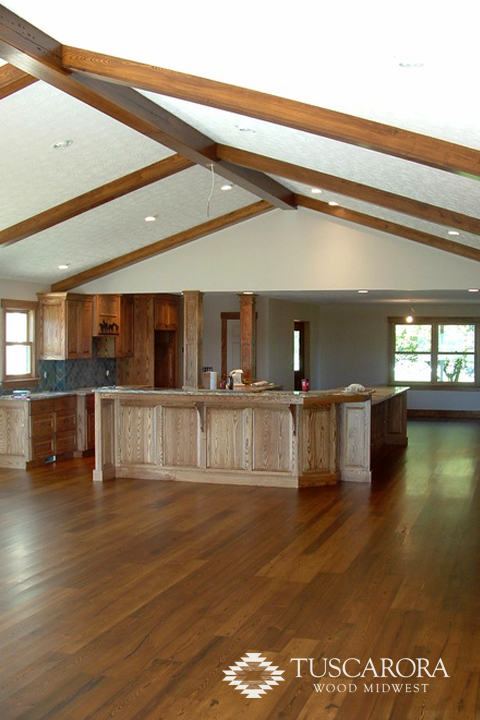 This wood takes stain well and provides a beautiful country feel. 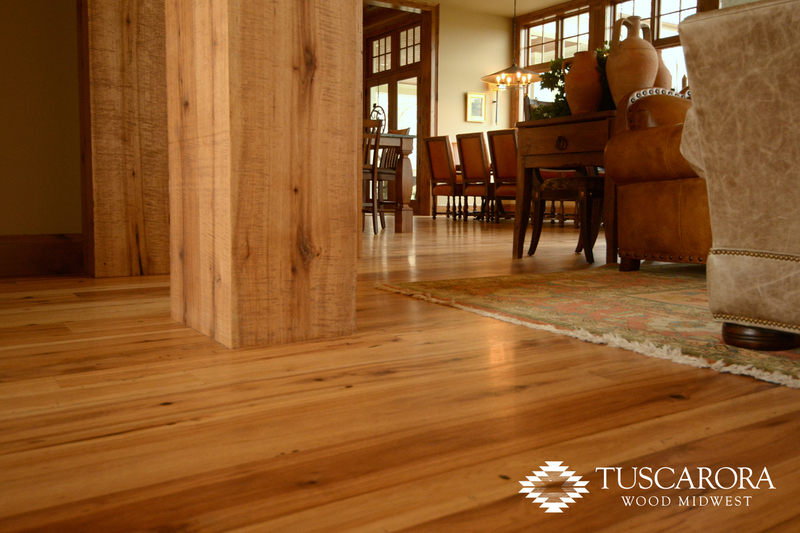 Hickory by far is the hardest wood we provide. 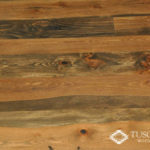 Its elongated grain pattern and tight, long cell structure produce a unique pattern full of knots and contrasting colors. 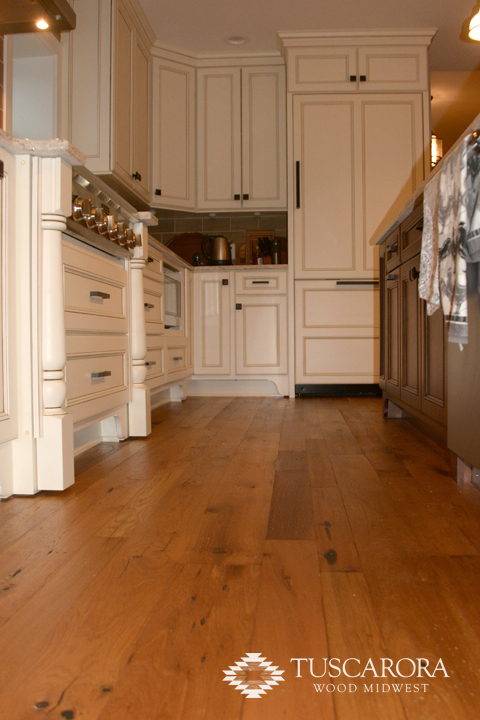 With its distinct grain and light-blond to cream colors, ash provides a beautiful and durable floor. 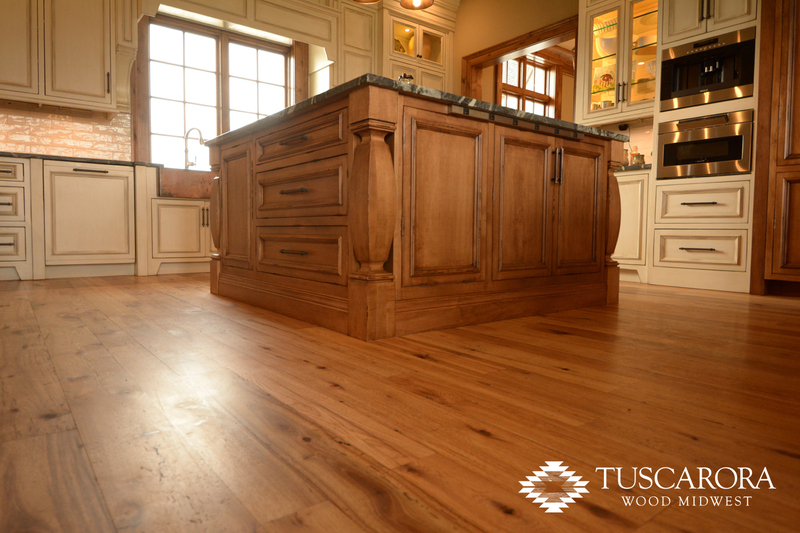 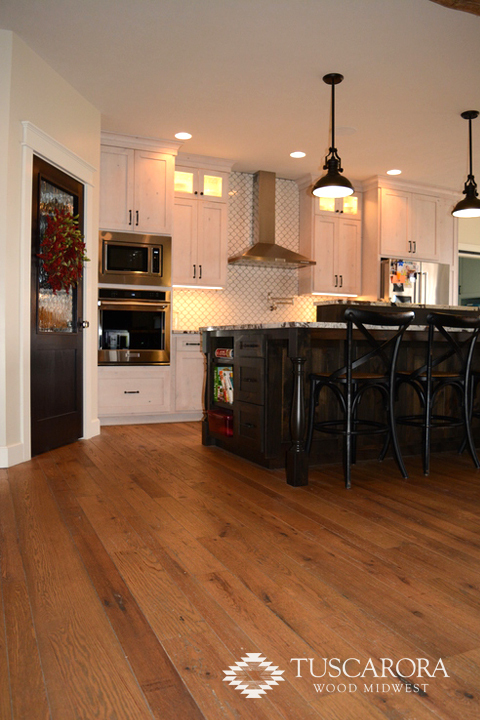 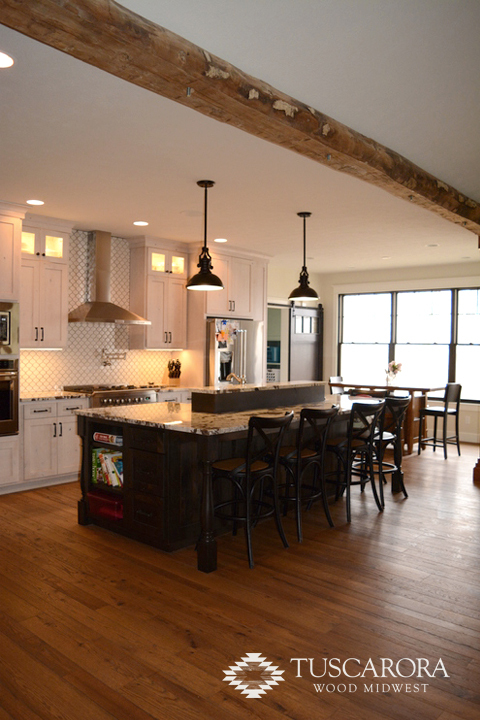 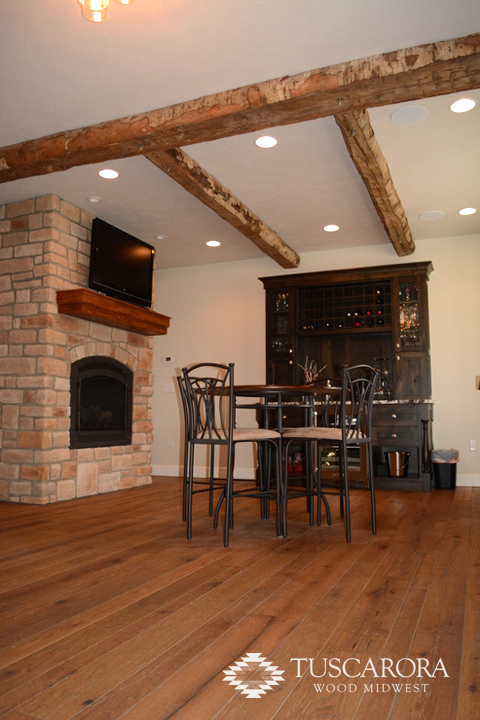 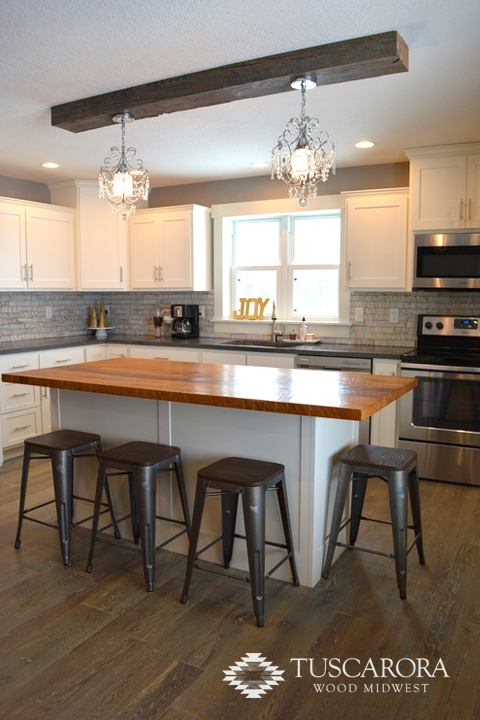 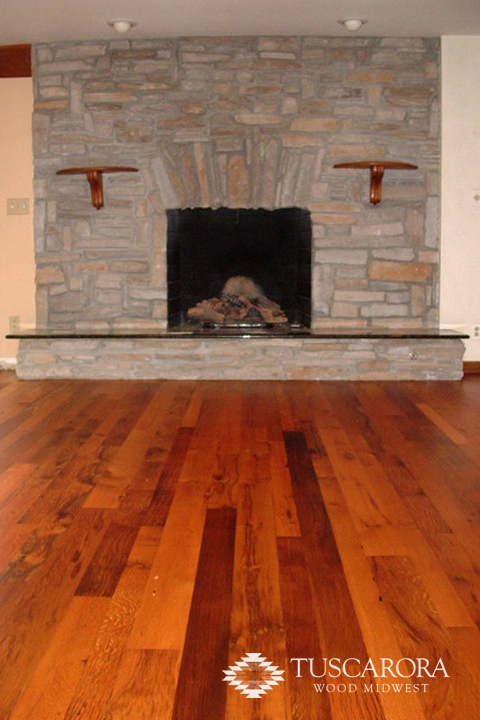 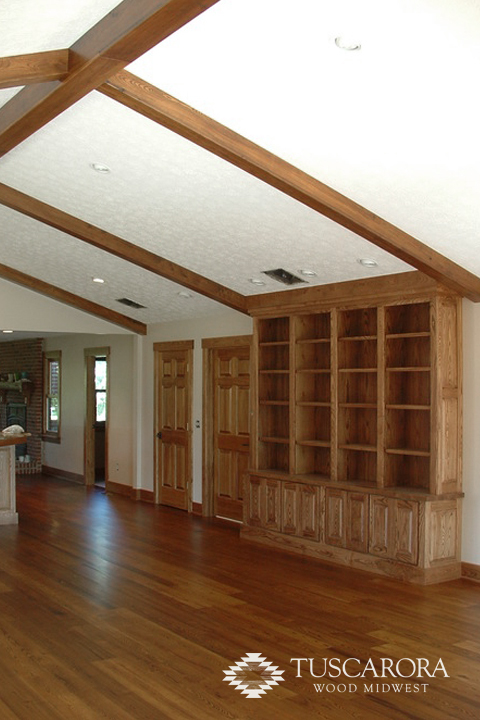 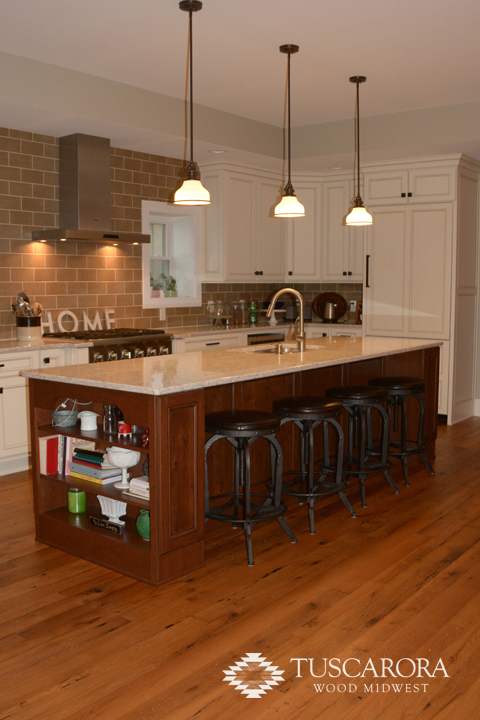 Although a reclaimed wood product, ash is typically a more select, quality wood with less worm tracks or character. 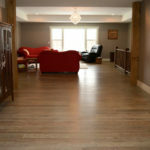 We also now offer salvaged ash wood flooring. 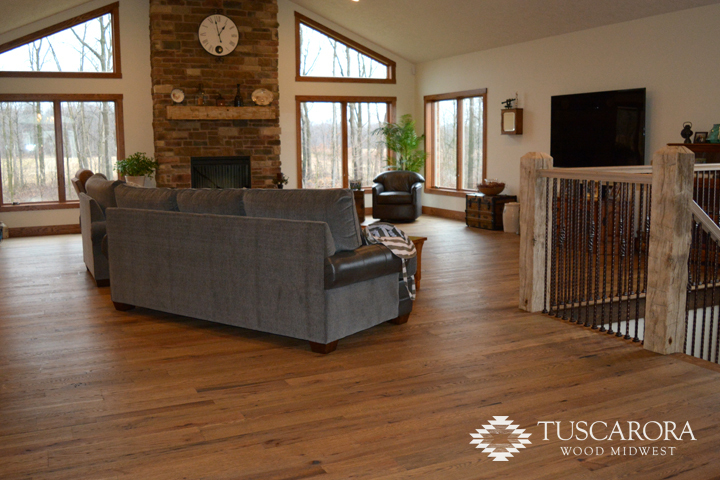 This wood is salvaged from trees decimated by the Emerald Ash Borer in the Ohio region. 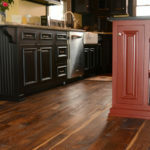 Contact us for more information on this new product. 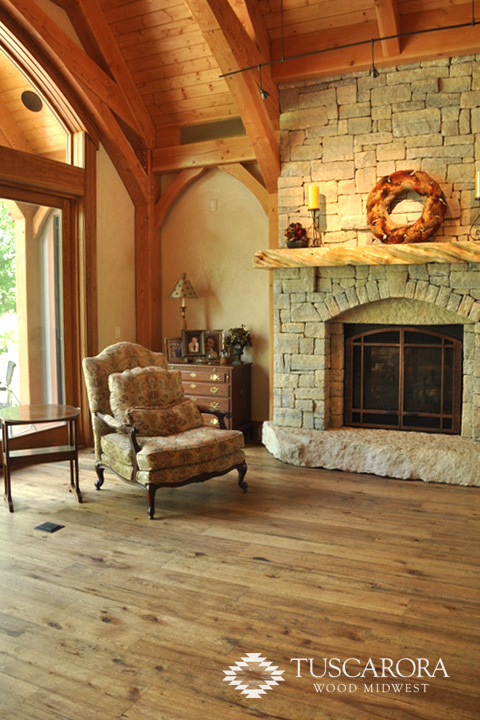 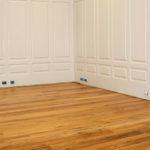 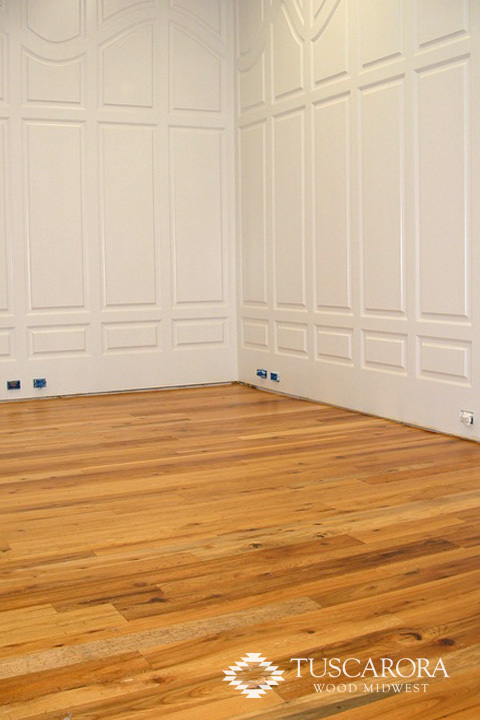 Beech is an elegant wood floor consisting of a fine, uniformed grain and texture. 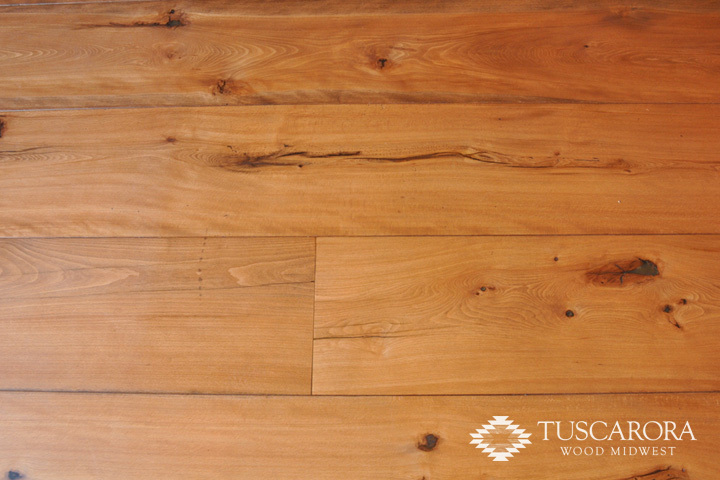 Heartwood is a reddish brown while the sapwood tends to stay pale white.